With £500 deposit contribution, and an additional £1000 off when you test-drive and buy. 8th May, SEC Glasgow | Learn more about the Motability Roadshow at Arnold Clark. You can now spread the cost of your service, MOT or repairs over a period of 6 or 10 months. Search over 300 jobs and find out what a career at Arnold Clark is like. We have over 200 branches in the UK. Let’s help you find the right one. 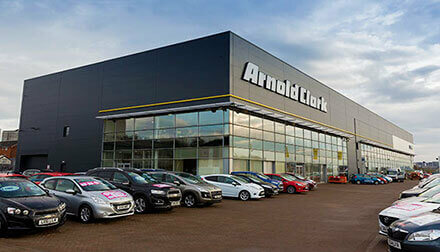 With over 60 years of experience, Arnold Clark is Europe’s largest independently owned, family-run car company. As winner of the sought-after Automotive Management Retailer of the Year award three years running, we are well placed to offer customers not only buying peace of mind but also the best choice and biggest discounts on all new cars, nearly new cars and used cars.